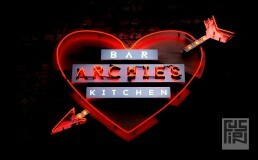 Archie’s is located beneath Leeds railway station and was Ossett Brewery’s third bar to their suite in Granary Wharf. Our brief was to create a relaxed, vibrant venue for an all day food offering and late night dancing. It needed to have areas for groups drinking and dining and to cater for the sports crowd with TVs in key locations. A spacious arrangement on the ground floor to allow for late night drinking and dancing and flexible seating to the first floor for dining and private functions. 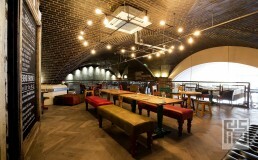 The original exposed brickwork of the dark arches is complemented with warm timber floors and reclaimed palettes on the walls. The metal work details from the stairs and display shelves create an industrial style, highlighted with feature light fittings and pops of bright coloured fabrics on the eclectic mix of furniture. 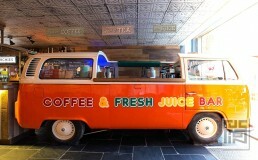 Installing a VW camper van, which is a nod to the address (Arch V and Arch W) introduces a fun element providing a coffee and juice station. Archie’s has comfy sofas for a laid back atmosphere during the day and is a fun lively venue at night under the disco ball dance floor.